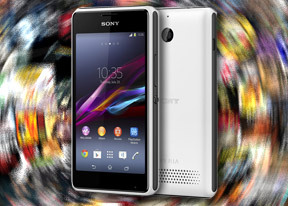 The Sony Xperie E1 is built around a 4" TFT LCD display of WVGA resolution (480 x 800 pixels) for a pixel density of 233 ppi. That's the most Sony could've given the phone considering the Snapdragon 200 chipset and we have to say it's not too bad. Color reproduction is decent and while the contrast is rather poor, the screen's brightness than the Xperia E's display. Naturally, it's not as sharp as a 720p screen, but you're not being charged for one of those either. Viewing angles are rather mediocre and there's a noticeable color shift when looked at an angle. As you can see the sunlight legibility isn't something spectacular. However, thanks to the increased brightness it's somewhat better than the original Xperia E.
We were pleasantly surprised from the Xperia E1's battery performance. It's a 1,700mAh Li-Ion unit, which is slightly smaller than what's found in some of the phone's competitors, but it puts up a fight. Talk time is excellent and because the E1's screen isn't very bright, the web browsing time is pretty great, too. 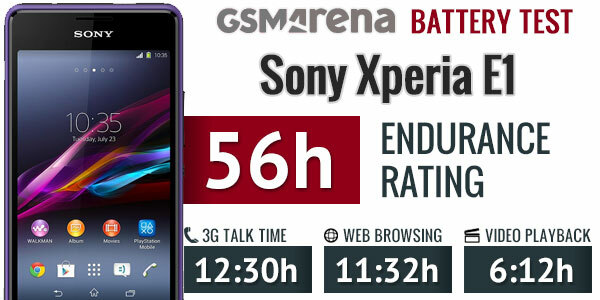 Overall, the Xperia E1 managed an endurance rating of 56 hours, which means it'll easily take two days before you need to charge it, if you use it for 1 hours of talking, web browsing and video playing a day.